SILVER SPRING, MD – The Montgomery County Planning Department, part of The Maryland-National Capital Park and Planning Commission, is accepting applications from county property owners who may be eligible for a one-time, 25 percent property tax credit for restoring the exteriors of their historic structures during 2018. To be eligible for the Montgomery County Historic Preservation Tax Credit, the property must be listed in the Montgomery County Master Plan for Historic Preservation. Search here to determine if your property is listed. Owners must file an application, including documentation of the repairs that were done, with the historic preservation staff of the Planning Department by 5 p.m. on Monday, April 1, 2019. The Montgomery County Historic Preservation Commission will then evaluate the applications to determine whether the scope of the work meets the eligibility requirements for the program. The work must have been completed no later than December 31, 2018. Questions? The Planning Department’s Historic Preservation Office staff will be available from 1 to 3 p.m. on Fridays in February 2019 to assist with the Historic Preservation Tax Credit applications. Residents can stop by the office (8787 Georgia Avenue, Silver Spring, MD) during those hours. View a short video about the Historic Tax Credit program offered by the Historic Preservation Office. Download the tax credit application here. Repairs, restoration or preservation of exterior features of designated structures are considered for the Montgomery County Historic Preservation Tax Credit. New additions and interior work are ineligible. Repairing and maintaining outbuildings, such as barns and garages. 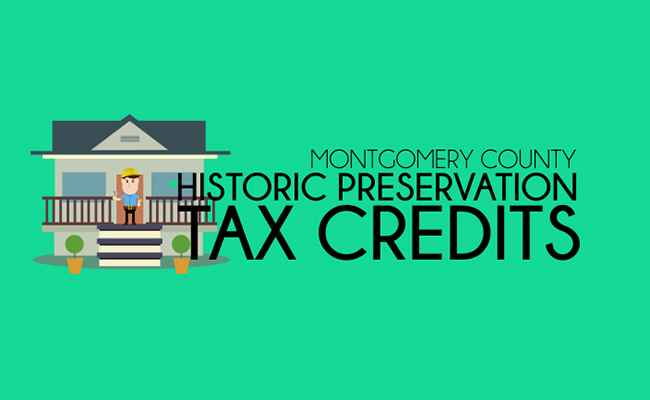 The Montgomery County Council passed legislation in 1984 to create the historic preservation tax credit program for county-designated historic properties. Since 2013, owners of properties listed in the Montgomery County Master Plan for Historic Preservation are eligible to receive 25 percent of documented improvement costs for exterior maintenance, restoration or preservation work. The approved credit is applied to a property owner’s tax bill. In 2018, the Historic Preservation Commission approved tax credits for 80 projects, representing more than $1.8 million of investment in historic properties. For more information about filing a tax credit application, please contact Michael Kyne, Planner Coordinator of the Historic Preservation Office at the Montgomery County Department of Planning (telephone: 301-563-3403); email: Michael.Kyne@montgomeryplanning.org.